The Cockshutt Model 40 had a six-speed gearbox, as well as two reverse speeds . 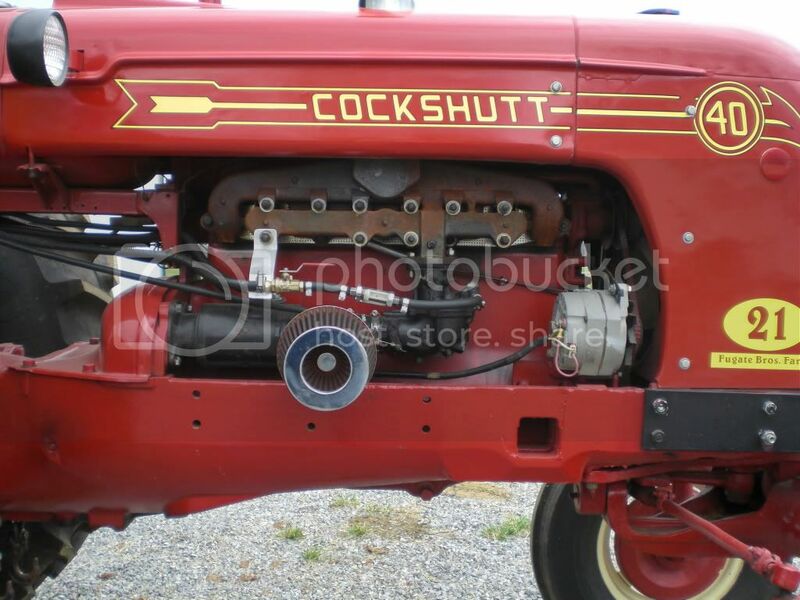 The fastest forward speed of this tractor was 12mph(19.3kph) in sixth gear. In its second reverse gear, the fastest speed was 5mph, or 8kph. The two bull gears that had been added to this new transmission proved to be quite strong, especially when it came to tractor pulling. When the Model 40 was introduced in 1949, only a gasoline engine was available. The next year, however, Cockshutt began offering a 230 cubic inch Buda diesel engine. In 1953, a distillate engine became available, and in 1955, a 269 cubic inch Perkins diesel engine was being offered. By the time the Cockshutt Model 40 ended production in 1957, almost 15,000 had been sold. Can anyone tell me what the belt drive for a Cockshutt 40 is worth. I remember Cockshutt 40 with Buda 6 cylinder 230 size motor one on farm grew up on in North Port Hope Ontario CANADA it was 1 , 18 , 1950 bought buy my grandpa Bill Cann Sr and my uncle Bill Cann Jr drove back home fromm were sold in Ontario Canada to home farm and heard was April 1, 1950 bought ! Not sure if correct price went for bought heard $3,800 my grandpa bought for but my Uncle Bill was age 16 that year got it and used right up April 30, 1994 but funny part the tractor was always 6 volt plus hear in 1968 the pull switch and push button never after that so went to a key ignition switch wire up to insted ! Also all years was around the cigra lighter wss gone but heater points still on and that tractor was unbeatable! But the one thing do laugh my Uncle Bill change fluids on it plus change Muffler to THRUST red Road Runner Silencer pipe then got to loud he put big Round muffler on to quiet with rain ! But great pulling tractor always and seen them in tractors pulls and do well!